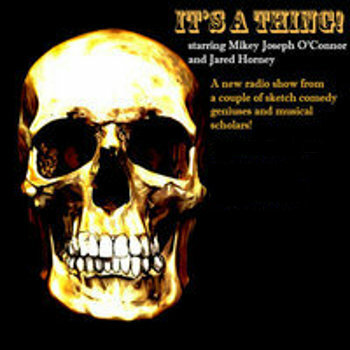 The eighth It's A Thing finds Mikey and Jared far from their usual studio in the Alps on a whole new continent. Mikey attempts to make amends with his brother and father after last week's "Razor-Scooter-broken-leg-Playstation-3-purchase" debacle. It's a heart-warming series of fathers and sons and brothers, and family. But can Mikey's tall tales stand up against Jared's small stories? It's a tough task given that Jared will mention that movie where Bill Murray keeps waking up over and over and over again to repeat the same day. What's that movie called? Moments include: sketchy cabs and borrowed time, waiting tables at terrible breakfast restaurants... (Gas Lantern Media does not condone the throwing of bricks through storefront windows.) Oh man, and there are pie trees! All the flavors of the rainbow! Great tunes fill in the gaps between massive life-changing revelations! Isn't that a treat!? Will they survive to create a potential ninth and tenth podcast? Yes. Sorry to spoil it. But, yes. Yes they will!